Tony Gonzalez announced today that he would be retiring as a Kansas City Chief. Tony was recently traded to The Atlanta Falcons for a second round draft pick - which was an extremely questionable trade - and will report to Falcons training camp in a few weeks. At a recent fundraiser hosted by "Shadow Buddies", a charity group that Gonzalez helped found and operate, Tony announced to the eager crowd that he would officially retire as a Kansas City Chief. This is an exclusive KCMB News story, as they were at the event and videotaped Tony's heartfelt speech (see video below). The Chiefs fans in attendance cheered when he told us this news, and we now know that when Tony is eventually inducted into the NFL Hall of Fame, it will be as a representative of the Kansas City Chiefs. 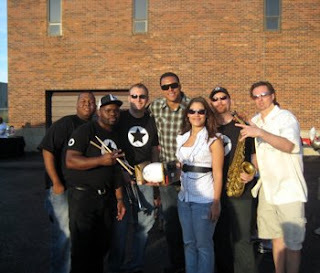 Gonzalez gave away several pieces of memorabilia including his last autographed football, which he presented to the Official Band of The Kansas City Chiefs, "The KC All Stars" (pictured above at the event with Tony) who he mentions and thanks in the video. Tony Gonzalez played for Kansas City from 1997-2008 and was hoping to win at least one NFL Playoff Game before he would retire. He has failed to do that in KC and will now try his luck in Atlanta. He will wear number 88 in Atlanta as he did with The Chiefs, however it will be the Chiefs who will lay permanent claim on Gonzalez when he is added to the list of the best NFL players in history at Canton. 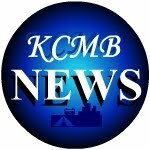 KCMB Kansas City News celebrates their 3rd anniversary! 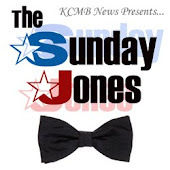 Here at KCMB News we would like to thank all of our talented writers who have made this Kansas City News site into the powerhouse that it is today. 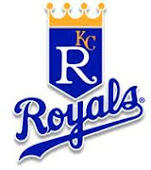 It is not easy to create a new Kansas City News site, but we succeeded with just a handful of writers and entering into our 4th year we are going forward listed number 6 on Yahoo! for the search term "kansas city news", number 8 on Bing for the search term "kansas city news" and we are currently in the top 5 searches on Google for several different topics. 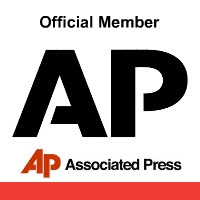 We would like to thank the people of Kansas City who have been with us since the beginning, and we look forward to bringing you wonderful and exciting news stories for years to come. Happy Birthday KCMB! We have enjoyed reading your articles, and it is good to see a young upstart news source like this get a voice in Kansas City. Keep telling it like it is, we get enough "dumbed down" news from the other stations. It's nice to hear that Tony Gonzalez will retire as a Kansas City Chief even though he had a lot of success in Atlanta. The fans in Kansas City really appreciate Tony Gonzalez and would love to see the good old red and gold hanging in the Hall of Fame when Gonzalez retires. Absolutely! Tony Gonzalez should retire a Chief since we basically raised him to be the player that he is today. Plus, everyone knows that Atlanta is going to choke in the Playoffs this year anyway (sorry Tony). We think that Tony Gonzalez should retire in Atlanta. He came here for a reason, The Kansas City Chiefs just weren't getting it done for him. He couldn't win a single playoff game in Kansas City and the Chiefs were wasting his valuable talent. Tony Gonzalez should retire with dignity, with a team that wins, and cares about it's team and it's fans, as the Chiefs clearly do not. We were at this event when Tony Gonzalez announced that he would retire as a Kansas City Chiefs. It was a very proud day for our city and we have missed Tony for all of the years that he has been apart from our program. Moeaki is starting to come along, but it will be hard to replace number 88 as the Atlanta Falcons will also soon find out. It is an honorable thing that Tony Gonzalez will retire as a Kansas City Chief. He entertained fans here for almost a decade and although he never won a Playoff game, he did enjoy some great seasons which contributed in majority to his current records. Tony Gonzalez would have been great anywhere he would have played, but since he spent most of his playing time in Kansas City, he should retire as a Chief. Tony Gonzalez should come back for one final season before he retires and play for The Kansas City Chiefs, Joe Montana, Warren Moon, Anthony Becht style! Go Tony! That's what I was thinking! How cool would it be for Tony Gonzalez to return to the Kansas City Chiefs for one last season before he announces that he will retire as a Chief. A perfect ending. Congratulations to Tony Gonzalez on making the Pro Bowl again in 2012. There is no doubt that he is the greatest tight end to ever play the game thus far, and it is great news that Tony will retire as a Kansas City Chief. It will be interesting to see what Tony Gonzalez has to say to the press after the Falcons playoff game coming up. If he retires, and announces his retirement hopefully it will not be with The Kansas City Chiefs but with The Atlanta Falcons, especially if they win the big one this year. The world is waiting for Tony Gonzalez to announce whether or not he will retire, and also whether he will retire as a Kansas City Chief. It seems likely that if the Falcons go deep into the Playoffs, or even win the whole thing, Gonzalez will retire after the 2012 NFL Season. Well, it seems to be official that Tony Gonzalez will retire a Kansas City Chief, however he hasn't officially announced it yet. This video seems to prove that he will retire a Chief, so that is good news. Way to go KCMB! It's good to know that Tony Gonzalez will retire a Kansas City Chief. He spent the majority of his playing time in KC and the fans here supported him even after he left the team to join the Falcons. A lot of Kansas City Chiefs fans were hoping that Atlanta and Gonzalez would go to the Super Bowl this season, but at least Tony Gonzalez got his first ever playoff win. T-Go! Tony Gonzalez will retire a Chief, sources say, and now that we have seen this video it appears that KCMB News got this story quite some time ago. It is great that Tony Gonzalez will retire a Kansas City Chief, but what really matters right now is that we won't be able to see him playing in the NFL ever again, and that is a sad thought. Thanks for the memories Tony!